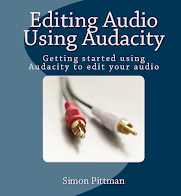 Pittman MusicDB includes options to catalogue your tracks with very little typing – this includes importing audio file information, importing existing data from CSV files and getting CD information from the web! 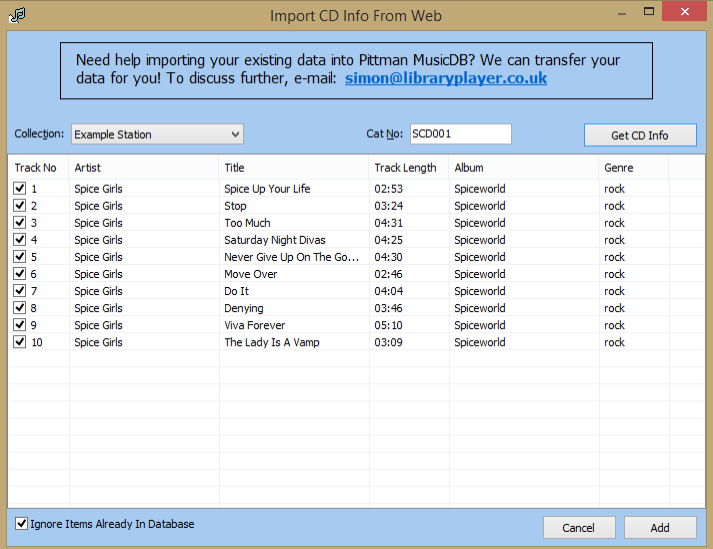 This short step-by-step guide will show you how you can use Pittman MusicDB to catalogue your CD collection! If you haven't already done so, you can download a free trial of Pittman MusicDB – there are no obligations, no spyware and we won't ask you for your e-mail address! Place the CD you want to catalogue into your computer's CD-ROM or DVD drive. 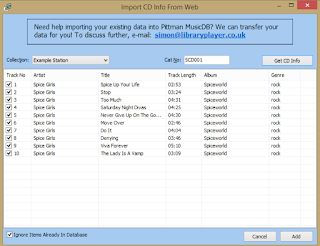 In Pittman MusicDB, go to the Data menu, and select “Import CD Info”. From the window that appears, select the station/collection for which you wish to catalogue the CD, and enter a catalogue number. For example, the catalogue number could be a label you have on the side of the CD to help identify it within your music collection. Click the “Get CD Info” button – this will retrieve the information for the CD from the web. The columns will then be filled out with the various tracks on the CD. If you want to edit a row before the data is added to the database, double click an item. If you are happy for the items to be added to the database, click the Add button! The data has now been added to the database – and will show up when people search for tracks that are on that CD.